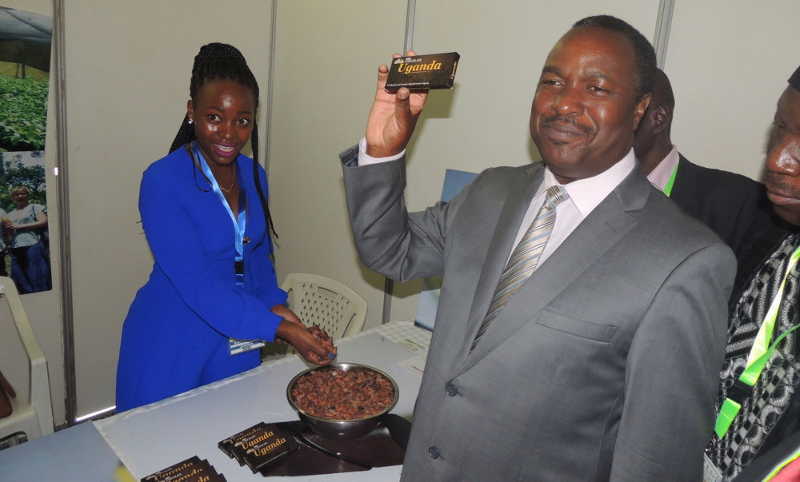 STI Minister Elioda Tumwesigye holds Ugandan-made Chocolate at a recent agriculture exhibition. Value addition to Uganda’s Cocoa, itself an outcome of science, was the reason behind his smile. Minister says he has been giving newly-wedded couples chocolate for their honeymoon. Now he has an even bigger reason to donate chocolate because it is made in Uganda. Uganda’s rapid population growth rate of 3 percent per year is a critical challenge to consider while analysing policies and laws in Uganda concerning food production to sustain current and future generations, says the Minister of Science, Technology and Innovations (STI). Dr. Elioda Tumwesigye, observed that projections that Uganda’s population will almost double to 75m by 2040, just 22 years from now, require a major shift in the mindset of Ugandans to embrace modernity and the use of science in producing food away from conventional practices used by our ancestors. Currently, Uganda is estimated to have close to 40million people, nearly double the number of people Uganda had in 2002. According to the 2002 Uganda Census report, the country had a population of 24m people. Dr. Tumwesigye, a medical doctor by training, now charged with directing Uganda’s Policy Agenda on Science, which implicitly means designing the country’s overall Development Path, is concerned that the conventional business-as-usual ways of producing food, will not enable Uganda and Africa in General to feed their population in the near future. Tumwesigye also noted that by 2050, Uganda is expected to have a population of 105million people. Minister Tumwesigye stopped short of stating that if Uganda has already lost people to famine as was experienced during last year’s prolonged drought, what will happen when the number of people that need food more than doubles. 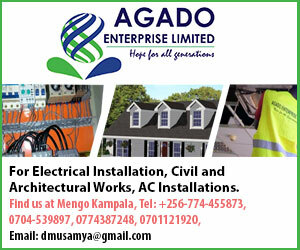 Last year, the Ugandan government was forced to suspend a number of long-term development programmes such as infrastructure development, so as to attend to emergence food-shortage calls across the country. More than 11 million people faced starvation as a result of a combination of drought as well as pest and disease outbreak – particularly the Fall Armyworm outbreak. The Minister’s predictions are corroborated by the Uganda 2014 Population Census Report produced by the Uganda’s Bureau Of Statistics (UBOS), the official government body on data development. Other reputable international population bodies such as Population Services International (PSI) also make similar projections, which suggest that Uganda’s largely young population, coupled with high fertility of about 5.6 babies for every woman, means that the momentum for population growth is very high. Tumwesigye made the observations during a one-day training for science journalists in Biotechnology that was held at Fairway Hotel and organised by the Science Foundation for Livelihoods and Development (SCIFODE). SCIFODE’s Executive Director Arthur Makara noted that the training was aimed at developing a critical mass of communication experts who can understand and be able to communicate new scientific trends in the agriculture sector. The training came at a time when the science community in Uganda is re-grouping to confront scepticism and deliberate efforts by some civil society groups to frustrate the introduction of a law to regulate the development of biotechnology in Uganda. SCIFODE’s Director of Communications Peter Wamboga Mugirya observed that the unrelenting opposition to the adoption of biotechnology is not based on science but rather on a deliberate campaign of mis-information that is funded by NGOs from western countries to make money from big chemical-based industries, but also to keep Africa back-ward and dependent on aid. Wamboga noted for example that opponents of Biotechnology in Uganda claim that the technology causes cancer, something that has been disproved by the World Health Organisation as well as the European Union office on food safety. Wamboga also noted that GMO research is not only restricted to agriculture but is also used in the health sector and has successfully helped Uganda to face up to disease challenges by introducing vaccines. Vaccines such as for TB, Measles, Hepatitis are products of Biotechnology. Minister Tumwesigye said that as Uganda continues to debate whether or not to adopt biotechnology, which was introduced more than 20 years ago, many other countries have moved to far more modern ways of food production such as producing food in high-rise buildings that rely on regulated lighting and mechanised agriculture among other innovations. Over the past two years, globally, the debate has shifted from Genetically Modified Organisms (GMOs) towards Gene Editing, a science that allows cells in any living organism to modify themselves in face of challenges such as diseases. Just this week, scientists from the John Innes Centre, University of Queensland and University of Sydney, Australia, revealed the discovery of a speed-breeding technique, which does not use biotechology, but rather uses a glasshouse or an artificial environment with enhanced lighting that allows for photosynthesis to take place much faster. Using the technique, the team has achieved wheat generation from seed to seed in just 8 weeks as opposed to more than four months we spend to produce wheat seed in Uganda. The discovery means that it is now possible to grow as many as 6 generations of wheat every year – a threefold increase on the shuttle-breeding techniques currently used by breeders and researchers. 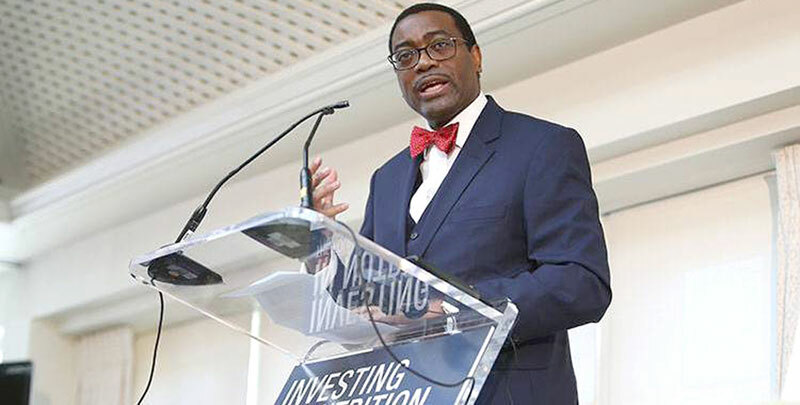 For minister Tumwesigye, for Uganda to realise her development goals as spelt out in Vision 2040, it has no choice but to embrace science, not just in agriculture but also other fields to spur higher employment, increased productivity and innovations in order to be competitive.